Travel in style and hassle-free with these. Keeping up with the continuous innovations of airlines (some planes have saunas inside!) are the travel accessories meant to indulge the jetsetter further. These accessories, launched in the past two years, showcase the travelers’ increasing demand for pleasure, convenience and style. SCOTTeVEST has been innovating travel clothing since the turn of the century, specifically vests and jackets with its multiple compartments. But in 2014, it launched Q.U.E.S.T., a vest with 42 pockets! 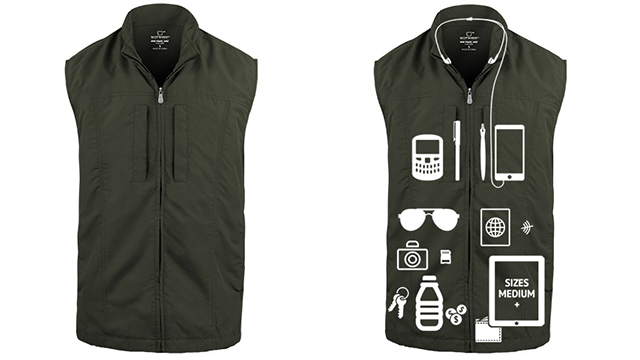 The vest, which is available for men and women’s sizes, can hold almost anything pocketable, with special compartments for tablet, smartphone, earphone, sunglasses—even earbuds. If only to make it more travel-friendly, it is stain- and water-proof, too. It also has a special compartment for the hood (of course, it also preempts you will need one when it rains) and a bigger one at the back to stash bigger items. Dora the Explorer would have loved this. Any long flights will have two nemesis: crying babies at the back or a snoring passenger in your row. SleepPhones Wireless can help you get that much needed rest without the rest of the world bothering you. Ultra-slim headphones are embedded inside a super-soft, machine-washable headband—tangle-free and comfortable for any wearer. The device will then be connected to a mobile app where any user can select what music or audio books they want to play. Any business traveler may have probably lost his or her luggage at least once—blame it on the chaotic airports, hectic schedules, and jet lag. This could easily be a recipe for disaster, but Victorinox has a solution for such potential problem. Enter the Checksmart Luggage Tracker. The device, launched in March this year, provides the location of the luggage through its owner’s mobile via an app. A traveler must place the tracker inside the luggage first. Once the tracker is registered in the user’s mobile application, it will notify the owner if the luggage has landed on the airport through email and text message. The device also has the ability to put itself on sleep mode once checked in to conform to airline regulations and wakes upon landing. Now no to missing luggage. Say goodbye to expensive roaming fees and frantic search for WiFi as this device lets you send a text message even without cellular service. Well, if the person you want to speak to is close enough. goTenna emulates the same technology behind walkie-talkies, only this time connected with any iOS or Android device. The user can simply set up the small antenna, connect the mobile gadget, and start sending texts to another unit owner. In urban areas, messages may be sent up to a mile’s range while outdoor areas can send messages even when the other is up to 4 miles away. No fears of getting lost now. A quick look in a tech store will showcase numerous gadget chargers promising to be the most efficient of them all. But Zolt is one notable product that has been leading the charge. Launched in 2015, Zolt can charge a laptop and two mobile devices at the same time with its three ports. On top of such feature is its small size, only slightly longer than drugstore lipbalm sticks at 93 millimeters and super light at 100 grams. The electric socket is also foldable thus decreasing its size further. For added flexibility, the charger may also be rotated once plugged in an electric socket. While all these already sound too good to be true, it also comes with a 6 feet cord that wraps around the charger, again, to keep it compact. Elyssa Christine Lopez is Entrepreneur.com.ph's editorial assistant / staff writer. Follow her on Twitter@elyssalopz.